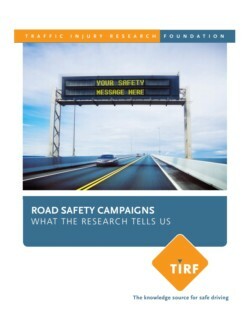 The Traffic Injury Research Foundation (TIRF) published a report entitled Road Safety Campaigns – What the Research Tells Us with funding from the Canadian Automobile Association (CAA). 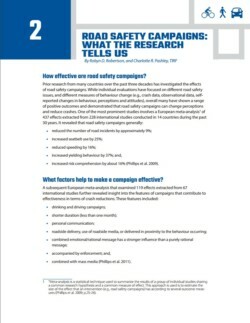 This report contains an overview of leading theories that provide the foundation for road safety campaigns. 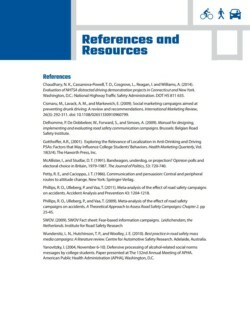 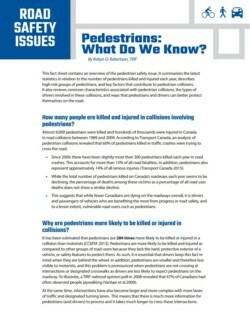 It is combined with a comprehensive summary of the research evidence related to the effectiveness of road safety campaigns generally, and examples of individual campaign evaluations from North America and Europe regarding drinking and driving, distracted driving, seatbelt use, speeding and vulnerable road users. 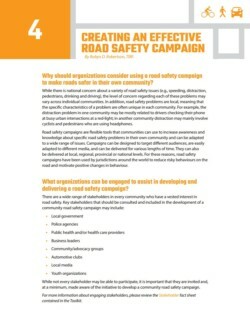 It also highlights what is known about learning styles based on educational theories and shares recommendations to help communities develop effective road safety campaigns. 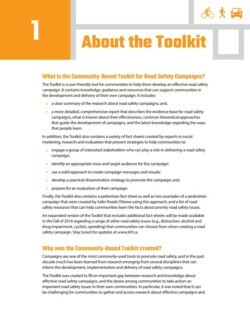 Building upon this work, in 2015, TIRF developed a user-friendly, community-based toolkit for road safety campaigns that can guide community efforts to develop effective campaigns that are specifically targeted to local audiences and focused on the road safety priorities that pose the greatest concern. 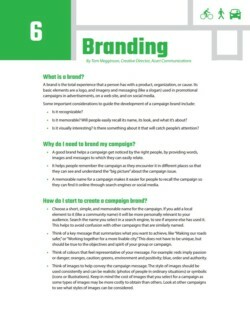 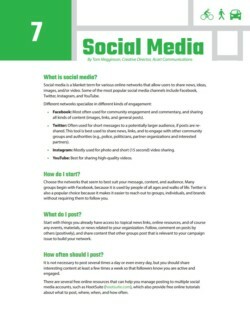 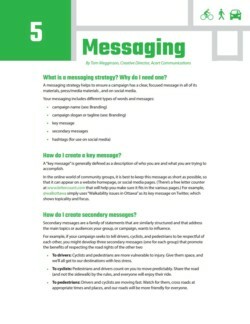 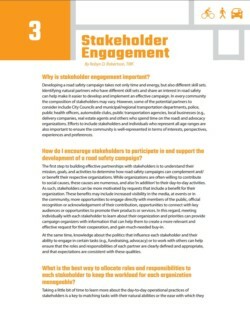 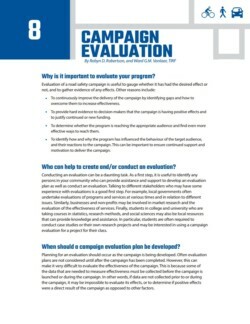 The Toolkit contains a series of issue-specific fact sheets related to campaign effectiveness, stakeholder engagement, campaign development, messaging, branding, social media and evaluation. 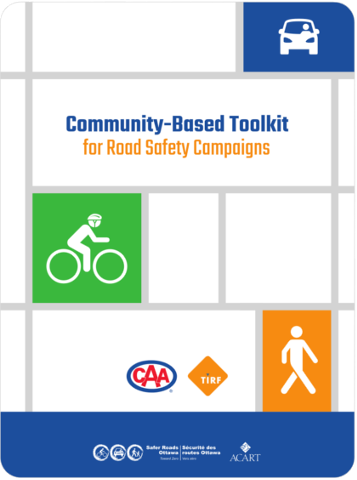 The toolkit includes a pedestrian safety fact sheet, and key facts about alcohol-impaired driving and young drivers which can also be selected as campaign topics. 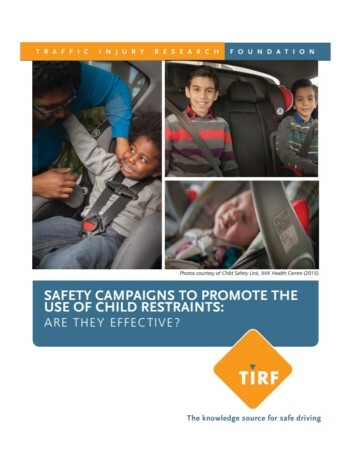 In 2015, TIRF published a related report on the use and effectiveness of child restraints, summarizing the research evidence related to educational and promotional campaigns in Europe, North America and other countries that focused on increased or correct use of a range of child safety devices.